1.In a large bowl, whisk together the oil, honey, both sugars, vanilla and salt. 2. Add the oats and seeds and combine well. 3. Line a 13 x 17 inch rimmed baking sheet with parchment paper. Pour the mixture down on the prepared baking sheet, patting it down to create an even layer. 4. Bake in a 325 degree Fahrenheit oven for 30 to 35 minutes, rotating the pan once halfway through. Remove from oven and allow the granola to rest, untouched, for 30 minutes. 5. 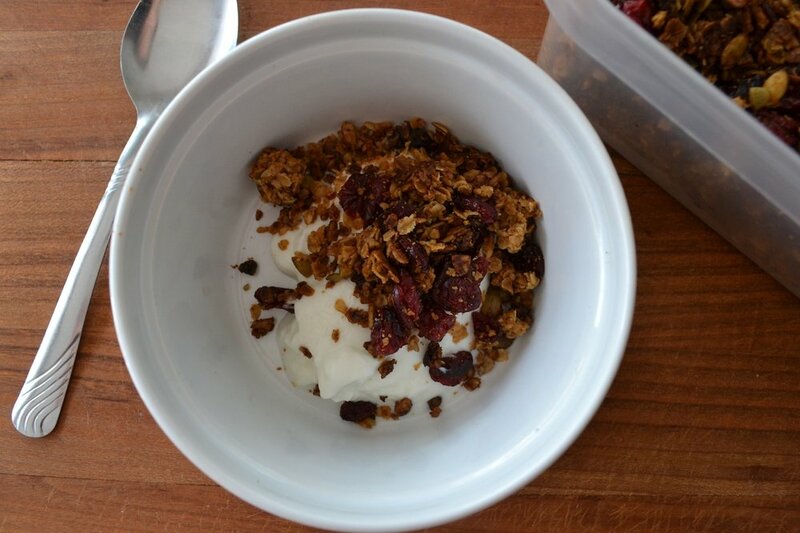 Break the granola into to chunks and mix in the dried cranberries. 6. Store in an airtight container, it should keep for three weeks. Then top your favourite yogurt or eat by the handful on its own (it's that good). I like a crunchier granola, and baked this batch until it was crispy and a little blackened on the edges, which I know is not everyone's preference so make sure to keep an eye on the baking while the granola is in the oven. Though I am not able to compare this to a nut-filled granola, the crunch of the seeds with the soft cranberries and sweet oats is a wonderful flavour combination, that doesn't feel too sweet yet still feels like an indulgence. It also makes such an easy breakfast or snack that is filling when there just isn't enough time in the day. Have you ever experimented with allergy-free granola? Have you come up with any awesome combinations?